- ours is currently a (once popular) green paint color with dark wood furniture and a cluttered home office in the retreat area. I am so going to buy some paint this weekend! this month! And maybe talk my husband into covering our headboard with padding and fabric. Am I crazy? It is supposed to be 102 degrees this weekend. Hold that thought, I'll just shop for fabric, painting can wait til it is cooler. It is a seriously gorgeous bedroom. 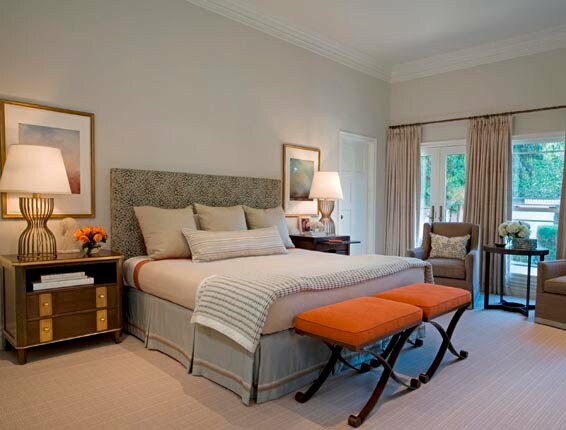 And I love that pop of orange at the foot of the bed. Do you love this !! ?